Casino Beat: Lighting the Tallest Christmas Tree! The M Resort Spa Casino will host a tree lighting ceremony for the nation’s TALLEST Christmas tree this Saturday evening. The special event runs from 5pm-8pm and will feature Christmas carolers along with other dance and musical performances by local artists out on the Villaggio Del Sole Outdoor Events Piazza. The event kicks off the M’s “12 Days of Giving” charity event in partnership with Three Square Food Bank, Catholic Charities of Southern Nevada and the Toys for Tots program. 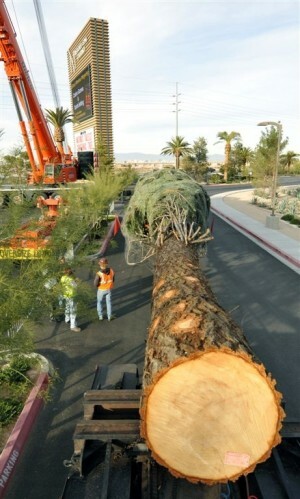 Last week-end, a massive 109′ Douglas Fir was brought to the M via tractor trailer. What a sight that must have been rolling down the I-15! For once I wasn’t heading to or coming back from Los Angeles, otherwise I’d probably have a rather surreal picture to share. The tree is even larger than the one that will be lit at Rockefeller Plaza in Manhattan. Billed as the largest Christmas tree in the nation, we are fortunate to have the opportunity to see it in our very own home town. Photos of the decorating process of this massive tree can be seen here. M Resort Spa Casino Chairman and CEO Anthony A. Marnell III and his family will light the fully decorated tree at 6:30 p.m. so mark your calendars and plan to attend because it promises to be one of the most festive events in town this holiday season! Evening entertainment will be hosted by SUNNY 106.5 morning personalities Melanie and Michael and include live dance and musical performances by Dance Zone, Las Vegas Academy, and the Helen C. Cannon Jr. High School. It’s not really Christmas if you don’t hear children singing outdoors, right? And for once, it promises to be a brisk, wintry evening here in Las Vegas so treat yourself to a hot chocolate with a shot of brandy or peppermint schnapps (or both) in it and sing along! I know I’m looking forward to it. Imagine decorating a 109 foot tree in only one week! Making a donation is optional, but the M Resort will be a drop-off location for donations of gently used coats, new, unwrapped toys and canned food from December 12-23. Collection boxes will be scattered throughout the resort for the convenience of those wishing to donate. In addition, The M Resort has created limited edition Christmas tree t-shirts. Proceeds from the t-shirt sales during the tree lighting ceremony will be distributed equally to the Three Square Food Bank, Catholic Charities of Southern Nevada, and the Toys for Tots program. The t-shirts are $10 and available for purchase at the iMagine Rewards Center. Three Square is Southern Nevada’s only food bank. The organization was established to end hunger in the valley by providing wholesome, nutritious meals to non-profit organizations that serve a wide range of Southern Nevadans in need. Catholic Charities of Southern Nevada works to give help and hope to people in need regardless of race, religion or creed. As one of the largest non-profit social service providers in the state, Catholic Charities offers the most comprehensive range of human services including diverse programs designed to help infants to seniors. The U.S. Marine Corps Reserve Toys for Tots Program distributes new, unwrapped toys as Christmas gifts to needy children in the community, providing a message of hope to less fortunate youngsters. Now for the bad news. Well, only if you listened to me about picking any favorites last week in the NFL. These are the dog days of December and so with that curious trend in mind I’m limiting this week’s picks to a select few underdogs in the hope of regaining a small semblance of prognosticating respect. Good Luck and Happy, Responsible Gaming! Oh, so you’re getting worried that this season might render your picking skills to appear to be near the level of the proverbial dart board process? At least, you’re gutsy enough to keep putting ’em out there.